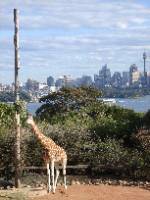 Blog from Sydney, New South Wales | What have we Dunn today?! We're back, and we are both still alive in case you were starting to worry there! Due to severe technical difficulties in the desert at Ayers Rock, we have not been able to upload our photos or blog for the past 2 days! Due to the large amount of travel involved in 2 of the last 3 days, this blog should bring you back up to date pretty quickly! On Tuesday in Perth, we headed back to Kings Park for a slightly more in-depth look at the birds and trees on offer (not Frank Macavennie birds - the local parrots!). The park really is an amazing place, and there were parrots everywhere. Despite the amount of botanics on offer we had to cut our trip slightly shorter than hoped as we remebered we had a flight to catch! 2 taxis later and we were back on schedule and sitting in the airport departure lounge. Bored and munching on some excellent local gums, I happened to enjoy playing my usual 'who do they look like game' where previous successes include a guy who looked like Nigel Mansell, Sly stallone and Kim Wilde... 'Look Louise.. That guy looks like Lenny Henry!' I said.. 'It is, that's why! He's on tour here!' came the response... CHILD IN A CANDY SHOP alert!! I spent the next 15 minutes trying to get a photo of him without him noticing, and you'll see that once it was obtained, Louises addition of a red nose helped identify him as the man himself! Journey to Ayers Rock over, we checked into our Lost Camel hotel (kind of like a desert Pontins without the family games and red-coats!) and got dinner sorted for the night. Unlike the nice restaurants we have been used to, we ended up with cheese and S&V crisp snadwiches from the local supermarket! We needed sleep. We started the next morning at 5am for a sunrise trip to Ularu! Of course, we tossed and turned all night worried we'd miss the bus. Feeling knackered, we caught the bus the following morning and tried to put out of our heads the fact that we were wearing shorts and the temperature was around 6 degrees. FREEZING! Arriving at Ularu in the pitch black was quite an experience, but over the following 3 cups of coffee (half an hour ish once I could read the time on my watch!) 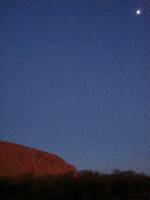 the sun gradually came up to change the colour of the rock from black to maroon to red and then orange! Quite a sight and despite the cold, well worth the early start! Dinner tonight was another experience not to be missed. 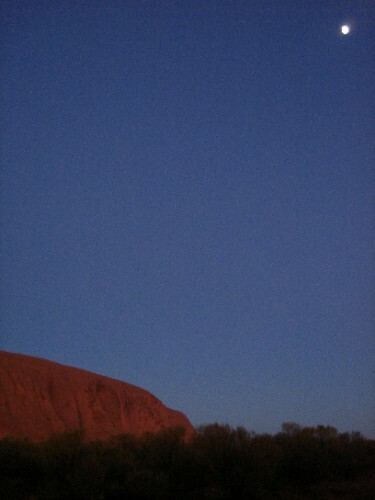 This time it was seved in the shadow of Ularu as the sun set over it. The night was accompanied by a Didge player (no idea how to spell the whole word, so hope you know what I'm talking about) and the food and company (Hans from Holland, Wendy from Sydney, Condalesa from Italy and 2 farmers from somewhere in the middle of nowhere!) were both really good. The top notch free-flowing wine and local port topped off the night nicely before we had a talk from a local astronomer due to the fact that there were actually no lights what so ever in the area and you could see a full semi-sphere of stars.. Great torch she had too. Could actually point out stars. Wow! Night and Ayers Rock visit over, we headed onward to Sydney where we checked in to our apartment in Darling Harbour with full laundry facilities to let us get some clean clothes sorted! No idea where we'll find the time to use them though as we have a bridge climb tomorrow morning and visits to the zoo and aquarium palnned for later. Photos to follow! Hope you are all well!